A natural wonderland located in northeast Arizona, Petrified National Park is best known for its wide variety of fossils. Fossilized trees from the Late Triassic period (about 225 millions years ago) as well as ferns, giant reptiles known as phytosaurs, amphibians and early dinosaurs have all been found here. The forest is also home to ancient ruins and historic buildings. Some of the most popular activities in the park are sightseeing, hiking, backpacking, horseback riding and bird watching. Designated trails range from half a mile to three miles. Puerco Pueblo Trail takes visitors along a short loop where they can view remnants of a 600-year-old, 100-room pueblo. Petroglyphs, or rock engravings, can be viewed from the south end of the trail. Petroglyphs can be anything from name carvings to calendars marking the events of the sun. The Giant Logs Trail, which is about three-fourths of a mile long, features many of the largest and most colorful logs in the park — the “Old Faithful” log is almost 10 feet wide at the base. Geocaching is another popular park activity. Sponsored by the National Park Service, geocaching is a sporting activity where participants utilize GPS technology to scout coordinates and learn about the park’s awesome geological and paleontological features. The Painted Desert Inn, a National Historic Landmark, is a museum and bookstore. In the museum visitors can view tools and artifacts left behind by the CCC and wall murals by Hopi Indian artist Fred Kabotie. The entrance is flanked by petrified wood used in the inn’s original construction. A visit to Petrified Forest National Park wouldn’t be complete without watching the sunset over the Painted Desert. Kachina Point, a two-mile section of road that overlooks the red part of the Painted Desert, is one of the best viewing spots. The park is open year-round, except Christmas Day. Times for entrance gates vary. Check the website for details. The entrance fee is $5 per person, or $10 per vehicle. A permit is required for all backcountry camping. Camping is allowed within the Petrified National Forest Wilderness Area if campers are at least a one-mile hike away from two designated parking areas. Backcountry permits are available free of charge from any of the visitor centers during parkhours. Visitors should refrain from removing any of the petrified wood and other cultural artifacts; doing so is prohibited by law. Petrified wood collected from private land outside the park is available for purchase at park gift shops. Many of the parks animals are either nocturnal or crepuscular, meaning they are most active at night or during the dawn and twilight hours. All of the wildlife species in the park play an important role in the desert ecosystem. Reptiles, for instance, eat an abundant number of insects, scorpions, spiders, small mammals and even other reptiles. This helps to keep species in check, preventing an infestation of one single species. There are many known reptiles in the park, including common kingsnakes, striped whipsnakes, eastern collard lizards and sagebrush lizards. The ornate box turtle, known for its ornate and colorful shell, is the only turtle species known to inhabit the park. Thirteen thousand years ago, nomadic hunters and gatherers known as the Clovis Culture roamed what is now Petrified Forest National Park. The first publication about the Petrified Forest dates from the Whipple Expedition of 1853. Lieutenant Amiel Whipple first documented the petrified wood from the area that is now the park while searching for a route for the railroad along the 35th parallel. With the opening of the railroad in the 1880s, access to the area increased bringing tourists. 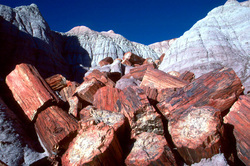 Interest in petrified wood as a commercial product also peaked during the 19th century. All of this alarmed residents of the area, who encouraged the federal government to designate the area as a national park in 1895, but this first attempt failed. Although it became protected as a national monument a little more than a decade later, Petrified Forest National Park wasn’t established until December of 1962. December 8, 1906 – President Theodore Roosevelt designates the area as Petrified Forest National Monument. September 23, 1932 – Over 53,000 acres is added to the Petrified Forest National Monument. October 23, 1970 – Over 50,000 acres of the park is designated as Petrified Forest National Wilderness; it is one of the first national parks to receive wilderness designation within its boundaries. May 28, 1987 – Painted Desert Inn is designated a National Historic Landmark. Click to see a detailed Petrified Forest National Park map.